"This isn't just a CD. It's a revelation and for me the realisation of a dream." "the music and the techniques used by Heymann, many of them rediscovered or even reinvented by her, will blow you away"
"an outstanding work of artistry, scholarship, partnership, insight and imagination"
"transports the listener to a lost world of austere but intense melody." "... long awaited ... Ann's playing is simply stunning, showing her up to be an absolute master of the instrument, and the variations in particular are virtuoso displays of harper's ability and instrument's potential. " "This is a fantastic CD! ... 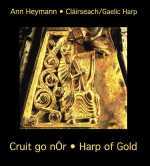 I really am enjoying hearing cláirseach with other period instruments, as the recording really puts you 'there' ..."
"It is simply awesome - the Grand Mistress of the harping world once again lights the way for all to follow ... and the sound of the recording is terrific - never heard a harp come through my sound system so clear, resonant and powerful." Read a review at A Spiral Cage.